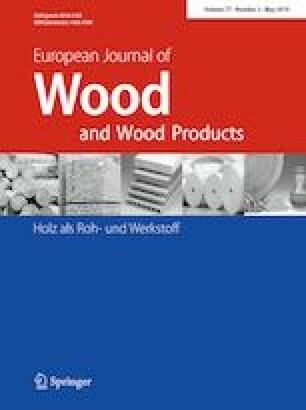 The aim was to evaluate the oak wood discoloration after ammonification and after alternative treatment by iron nanoparticles, the effect of extractive content on this color change, and the color stability of the treated wood during weathering. Alterations in the color space CIEL*a*b*of the modified oak wood were evaluated and the values were compared with the color spaces of untreated recent and subfossil oak wood. The results demonstrate noticeable color darkening for both treatments. The a* and b* values in the wood modified with ammonium were also reduced. For both treatments, a significant correlation was found between the extractive content and the overall color change. Additionally, the color stability of the modified oak wood during accelerated ageing under diverse external conditions was studied. The color change caused by the artificial conditions was measured on modified oak heartwood samples and the values were compared with the color stability of recent and subfossil oak wood. The results demonstrate that all the test specimen sets underwent photodegradation. The best color stability in the dry mode was attained with the ammonium-modified wood and the maximum impact of weathering was detected for the iron nanoparticles treatment during the wet mode. Dita Machová and Jan Baar contributed equally to the paper. This work was financially supported by the research grant of Technology Agency of the Czech Republic (TAČR), project number TG02010074 and by the Scientific Grant Agency of the Ministry of Education SR and the Slovak Academy of Sciences Grant no. 1/0822/17. The authors wish to acknowledge support from Tadeáš Rozboril and František Foret concerning laboratory work.